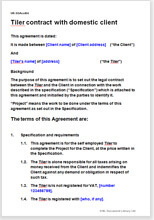 Simple form of contract for a tiler to use for every domestic or business client. Very easy to use. Helps to protect against claims and get money in. Use whether you are self employed as individual or work through a company. Comes with extensive notes explaining every item and leaving you simply to choose and use. This is a simple form of tiler contract for a tiler to use for every domestic or small business client. Very easy to use. Helps to protect against claims and get money in. Use whether you are a self employed individual or work through a company. Comes with extensive notes explaining every item and leaving you simply to choose and use. This contract has been kept simple so that you can use it even on a very small job. You can put this to your client and say “This is what we have agreed. Sign here.” You do not want to be embarrassed in presenting ten pages of legalese. We are giving you a document you can print on two sides of A4. This tiler contract covers just those areas where you most need legal strength: limiting your liability if things go wrong, cash collection, payment for extras, no posting on social networks. Of course, with the wide Net Lawman experience of the real World, there are a few more helpful points too. This contract also contains drafting notes to make quite clear what the text means and to advise you on choosing from the options we give. As a tiler, you need protection. If you have not arranged for up front payment you are always at risk that your client will not pay. We give you the option of several alternative payment procedures from all up front to all on credit. Limitation of liability features large in this contract. Helps to protect you from a client who thinks he is too clever. Net Lawman also offers a range of more comprehensive construction industry contracts at Contracts for services and other consumer services at Building trades home work contracts. "Have added your main page to my favourites for future use." "Your templates have saved me valuable time and money in helping to create our website designed to help people choose their perfect dog or puppy."